Tallahassee, FL—According to news media outlets across the United States, the Hacktivist group ‘Anonymous’ has made Florida Governor Rick Scott their latest “Target” in regards to several acts of corruption within Florida’s Judicial System, with corruption being supported by The Florida Bar and the Judicial Qualifications Commission, all headquartered in Tallahassee, Florida’s a.k.a Florida’s 2nd Judicial Circuit, where Lead Public Defender, Nancy Daniels, has held office since 1990. When women bonded together to fight in ‘The Women’s Rights Movement’, the bond was tight, but it was not tight enough! Oh, yes, women received some ‘rights,’ but, yet, and still today, women are not only fighting for equal pay—to receive the same pay as men for the same work—women are fighting just to have control over their own bodies. Now, as Nancy Daniels has finally decided to retire, the question MAUL has for the outgoing, long-serving Public Defender is, “If you were not going to ‘SHOW RESPECT FOR WOMEN WHO PAVED THE WAY FOR YOU,’ if you were not going to ‘HOLD YOUR HEAD UP’ and ‘FIGHT TO UPHOLD THE UNITED STATES CONSTITUION,’ then WHY ALLOW YOURSELF TO BE LOWER THAN ANY RIGHTLY CONVICTED CRIMINAL THAT YOUR OFFICE HAS REPRESENTED? For more than two decades, Nancy Daniels has been 2nd Judicial State Attorney Willie Meggs’ JUDICIAL WHORE! Granted—public defense is not easy. Public defenders are paid far less and have far less resources than state prosecutors. The folks at Gideon’s Promise, formerly known as Public Defender Southern Training Center, which is based in Atlanta, Georgia, are continuously striving to fully support those who have chosen careers as public defenders. Mr. Jonathan Rapping, the founder and president of Gideon’s Promise, is an Associate Professor of Law and a nationally renowned criminal justice innovator. Mr. Rapping’s does not teach public defenders to win their criminal cases through corruption. Nancy Daniels could have clearly used some of her time to attend Mr. Rapping’s training in her career. Instead, Nancy Daniels chose to LIE—and to LIE down in any position State Attorney Willie Meggs and Assistant State Attorney Jack Campbell ordered of her—and allow them to have their way with her and any indigent client that she represented. WHAT A WHORE! Nancy Daniels conspired with Assistant State Attorney Jack Campbell to manipulate pay codes in order to have cases that their office passed over (withdrew) to be handed off to any defense attorney of Assistant State Attorney Jack Campbell’s choosing. Not only does manipulating the pay codes hurt indigent clients, it cuts the throats—and cuts the hearts out of defense attorneys registered with the state of Florida, who may have been willing to do all that they can to help those who cannot help themselves. In May 2014, Nancy Daniels was awarded with the Talbot “Sandy” D’Alemberte Commitment to Justice Award, during Steppin’ Out 2014, an annual celebration hosted by the Innocence Project of Florida. Amazingly, it was during this celebration where the Florida Innocence Project honored Brian Banks, a California exoneree, who was wrongly convicted. (Attorney General Pam Bondi has failed to overturn convictions, so the Florida Innocence Project had to borrow Mr. Banks from California.) As Florida Governor Rick Scott tends to reward criminals (current Sheriff Mike Wood), Nancy Daniels was honored seven months after she stood in front of 2nd Judicial Circuit Judge Jackie Fulford and talk of how she manipulate pay codes for “certain defense attorneys” to get paid—defense attorneys chosen by Assistant State Attorney Jack Campbell. A process that not even Circuit Judge Jackie Fulford knew existed—before being appointed to the bench. Judge Jackie Fulford worked as an assistant state attorney for State Attorney Willie Meggs for nearly a decade—Jackie Fulford and Jack Campbell were co-workers for more many years. The process Nancy Daniels fed to Circuit Judge Jackie Fulford underscores the “EVIL” within Nancy Daniels. One of the key points of Nancy Daniels’ manipulation of pay codes for “certain defense attorneys” is to give State Attorney Willie Meggs’ Office leverage in cases against indigent clients—in most high profile cases within Leon County (Tallahassee)—Assistant State Attorney Jack Campbell was assigned as prosecutor. Assistant State Attorney Jack Campbell is the son of long-serving Leon County Sheriff Larry Campbell (died while in office in 2014). State Attorney Willie Meggs, who prosecutes cases in six counties—assigned nearly all high profile cases that were being investigated by the Leon County Sheriff’s Office—to Sheriff Campbell’s son, Jack to prosecute. The vast majority of Jack Campbell’s witnesses were his dad’s employees—Leon County Sheriff’s Office personnel. In the double murder case against Tallahassee Community College freshman, DeShon Thomas, instead of using AT&T data and documents to pinpoint cell phone pings of DeShon’s cell phone (track phone), Leon County Sheriff Criminal Analyst Leslie Rabon, used excel spreadsheets that she altered along with her printouts from Mapquest during her trial testimony—which was in favor of State Prosecutor Jack Campbell. Nancy Daniels has been credited for bringing Drug Court into the 2nd Judicial Circuit. Drug Court failed Florida State University graduate Rachel Hoffman. Ms. Hoffman attending Drug Court more than likely tipped law enforcement officers off—and made her a target and vulnerable. Ms. Hoffman is dead. Nancy Daniels failed seventeen-year-old, DeShon Thomas, and the victims—bank employees at both SunTrust Bank and Farmers and Merchants Bank in Tallahassee—when she manipulated the pay codes for an already convicted felon, Dawaun Williams, after Mr. Williams had robbed two banks. Through Nancy Daniels’ manipulating pay codes, allowed “a certain attorney” to represent Mr. Williams. That “certain attorney”—a private attorney—was handpicked by Assistant State Attorney Jack Campbell— and was registered with the state of Florida to defend capital cases only. Mr. Williams’ cases were not capital cases. The private attorney was a luxury payment for Mr. Williams for testifying in a double homicide case being investigated by Leon County Sheriff Larry Campbell and that Assistant State Attorney Jack Campbell was prosecuting where he (The Campbell Klan) had no physical evidence against 17-year-old, DeShon Thomas. DeShon Thomas has been KIDNAPPED—NOT WRONGLY CONVICTED! The ‘Grand Scheme in Tallahassee Courts’ was in full effect for years. The ‘Good Ol’ Boys Network’, that Nancy Daniels, in her ‘Whorish Ways’, LIE down for ALL OF THE BOYS. Hopefully, the citizens of Tallahassee—and all of Florida’s Second Judicial Circuit—will be better off without her. Where did the parents of Nancy Daniels, former Second Judicial Circuit Judge Jackie Fulford, and Florida State Attorney General Pamela Jo Bondi FAIL? These women, who may have once been regarded as “worthy women,” are WORTHLESS. And for what? For men to have their way with them? Extra money in their bank accounts? Lavish plane rides and hot meals? WOW!!!! Without a doubt these women ADMINISTERED A HUGE INJUSTICE TO WOMEN RIGHTS. Congratulations! Now that you’ve supported your beloved child’s decision to attend a college or university in Tallahassee (Leon County), Florida, please keep in mind that you WILL NOT have a say when local law enforcement officials and judicial officials plot together to deny your beloved child their constitutional rights if/when your beloved child finds him/herself on the opposite side of the law. Sadly, far too many high profile incidents involving young people that occur in Tallahassee are not escalated by the incident itself, but rather is escalated by local law enforcement officials and judicial officials who lie, conspire, rob and deceive young people. Just ask the parents of former Florida State graduate, Rachel Hoffman (23-years-old); the parents of Florida High School student, Darrielle Copeland (13-years-old); the parents of Tallahassee Community College freshman, DeShon Thomas (17-years-old); the parents of Florida State University student Erica Kinsman; and the parents of Florida State University student Jameis Winston. Thirteen-year-old, Darrielle Copeland’s only mishap was being in the front passenger seat of her mother’s vehicle when a speeding SUV barreled through a red light—striking (T-bone) her mother’s vehicle while her mother was driving her to basketball practice at Florida High School. The woman driver of the SUV—the wife of a Leon County Sheriff’s Deputy (who was also a co-worker of State Attorney Willie Meggs’ son and daughter) was not charged in Darrielle’s death. Many will agree that the Leon County Sheriff’s Office botched the traffic investigation when the Leon County Sheriff’s Office assumed jurisdiction over the investigation shortly after the crash. The traffic crash occurred in the jurisdiction of the Tallahassee Police Department. Darrielle’s mother was upset when she learned that both the Tallahassee Police Department and the Florida Highway Patrol had been forced away from the crime scene by the Leon County Sheriff’s Office. The driver of the SUV paid her citation; Darrielle Copeland died from her injuries. Darrielle’s mother and little brother, who were also injured in the incident, continue to fight for justice and mourn the loss of their beloved Darrielle. Having an older brother that was a few months shy of receiving a Bachelor’s Degree in Criminal Justice from Florida State University, and a mother who had attended college to pursue an Associates in Science Degree in Paralegal, was not enough to prepare seventeen-year-old, DeShon Thomas and his family, to combat the many “tricks-of-the-trade” that may have plagued Tallahassee for decades. A wealthy white male Republican being allowed by a white male Democratic sheriff to “play cop.” State Attorney Willie Meggs, a Democrat, filing documents with Leon County Clerk of Courts knowing that the sworn documents were fraudulent. The District Two Medical Examiners’ Office prevented from releasing two autopsies to Public Records under the orders of State Attorney Willie Meggs. A local defense attorney repeatedly withheld information from DeShon, a juvenile charged as an adult with Cultivation of Marijuana, Possession of Drug Paraphernalia, Two Counts of 1st Degree Murder, Possession of a Firearm by a Juvenile Delinquent, and Solicitation to Commit 1st Degree Murder. In spite of DeShon’s mother having paid the defense attorney, Greg Cummings, nearly $30,000, Greg Cummings did not come clean as to why he had not perform competently until after DeShon and his mother fired him. Mr. Cummings admitted to Assistant State Attorney Jack Campbell having committed prosecutorial misconduct. Prior to DeShon being charged with any crime, DeShon’s mother enrolled him in Tallahassee Community College’s Paralegal/Legal Studies program as a freshman at the age of 16. DeShon was in his 3rd semester at Tallahassee Community College when his pregnant ex-girlfriend and her brother were found murdered in their townhouse. Both of the young victims owed out a combined $750 debt. It was no secret that either of the victims planned on paying off their debts. Both victims were planning on moving out of town. On the night before they were to move out of town, a witness seen suspicious activity at their residence. The following morning both victims were found murdered. Instead of following up on the suspicious activity, the Leon County Sheriff’s Office began stalking and harassing DeShon. When DeShon informed his mother about a traffic stop by the Leon County Sheriff’s Office that occurred while he was riding in the backseat of an SUV with his cousin—where DeShon was asked to come to the sheriff’s office to discuss his previous relationship with the victims—DeShon’s mother believed that the right thing to do was go to the sheriff’s office in an effort to keep DeShon from being another “Rachel Hoffman”—meaning that she did not want law enforcement officials to scare her son into participating in an operation created by law enforcement, neither did she want her son to be forced into confessing to murders that he did not commit. Next, DeShon and his mother were locked in a room and denied access to an attorney. “Detective Odham” was extremely leading and arrogant in his role as a detective. There was absolutely nothing pointing to DeShon as having committed the murders. DeShon was not charged with anything in relation to having committed the murders. Detective Odham seemed very angry and seemed to be in a trance—DeShon’s mother knew that whatever Detective Odham was angry about had absolutely nothing to do with her or DeShon with the emphasis on “how family lookout for family.” Yet, DeShon’s mother told Detective Odham that he had made a “big mistake” by denying them (she and DeShon) access to an attorney. Detective Odham carried on as if he himself did not realize that he had done anything wrong. DeShon was not charged with the murders at that time. However, the Leon County Sheriff’s Office continued to harass DeShon and his mother. Eleven days later, when DeShon was charged with the murders, it was Detective Odham that claimed to have gotten voluntary incriminating statements from a co-worker/friend of DeShon’s. DeShon’s mother learned that Leon County Sheriff Larry Campbell and Assistant State Attorney Jack Campbell, the prosecuting attorney on DeShon’s case, were father and son. This gave credence to why Don Odham had emphasis on “how family lookout for family.” Next, DeShon’s private attorney, a local attorney by the name of Greg Cummings, had received nearly $30,000 before being fired for withholding exculpatory information from DeShon. Then the Office of Criminal Conflict took over DeShon’s case and carried out the corruption. The District Two Medical Examiner’s Office was forced to withhold information—the victims’ autopsy reports. A number of judicial officials played roles that denied DeShon’s rights during the judicial process. Nearly, three years after DeShon was charged with the murders, he went on trial. It was during the trial as to when DeShon and his mother learned that Leon County Sheriff’s Detective Don Odham was never an employee with the Leon County Sheriff’s Office. It was Leon County Sheriff Larry Campbell who had been assigned as lead detective on the case against DeShon to ensure his son, Jack Campbell, gets a conviction—with everyone else in the judicial process playing along. It has been five years since DeShon and his family has started the fight for his freedom. DeShon’s appeal was quickly filed and quickly denied. Many attorneys are afraid to get involved in DeShon’s case due to what has all been denied DeShon that led to his wrongful conviction, as well as fearing intimidation by judges and others. The sexual assault case involving Erica Kinsman and Jameis Winston proved to be botched by law enforcement officials when the Tallahassee police officer stated under deposition that he chose not to go obtain surveillance footage from the bar where Ms. Kinsman claimed to have been first accosted by Mr. Winston. Although the original complaint did not come from Florida State Police, Florida State University quickly settled a lawsuit with Ms. Kinsman for $900,000. Currently, Assistant State Attorney Jack Campbell is seeking to be elected Florida’s Second Judicial State Attorney. Jack Campbell has a history of “wheeling and dealing” with criminals. If elected as Florida’s Second Judicial State Attorney, he will be the one who will have full authority over all criminal cases in six counties—including Tallahassee. Jack Campbell has the same characteristics as a child molester—yet, he has the support of many of those within the judicial system—including The Florida Bar. So, parents, as you send your child off to attend college in Tallahassee, it is imperative that you pray. If for nothing else, pray that your child will not encounter the “EVIL TERRORISTS” that play key roles within the judicial process. Envision Credit Union Robbery; Who is to Blame for the Increase in Tallahassee Bank Robberies? State Attorney Willie Meggs, Assistant State Attorney Jack Campbell, former Leon County Sheriff Larry Campbell, The Florida Bar? Tallahassee, FL—Without a doubt ‘words’ circulate swiftly among inmates. Dawaun Williams, a previously convicted felon, robbed two banks in Tallahassee back in 2012. Dawaun Williams directly victimized bank tellers and patrons at the Farmer’s and Merchants Bank, and then again at SunTrust Bank before fleeing Florida. The Tallahassee Police Department and the Leon County Sheriff’s Office issued arrest warrants for Dawaun Williams. The Tifton County Sheriff’s Office in Georgia, along with the Southeast Regional Task Force, captured Dawaun Williams and transported him to the Leon County Jail, where Leon County Sheriff Larry Campbell was the overseer. At the time of Dawaun Williams’ being booked into the Leon County Jail, State Attorney Willie Meggs and Assistant State Attorney Jack Campbell were struggling to make a case against Tallahassee Community College freshman, 17-year-old, DeShon Thomas. DeShon Thomas had been charged with Cultivation of Marijuana, Possession of Drug Paraphernalia, Two Counts of 1st Degree Murder and Possession of a Firearm by a Juvenile Delinquent. DeShon Thomas had been in the Leon County Jail for over a year awaiting trial—which had been previously postponed three times at the State’s request. Circuit Judge James C. Hankinson and Circuit Judge Charles Dodson each had defendants facing charges. DeShon Thomas’ defense attorney, Greg Cummings, had received nearly $30,000 from DeShon’s mother, but had not deposed a single witness or prepared a legal defense for DeShon. In June 2012, after Greg Cummings learned that DeShon’s mother was seeking to terminate their contract and hire another defense attorney, Assistant State Attorney Jack Campbell made personal and financial arrangements for Dawuan Williams. Dawaun Williams, who had only been in the Leon County Jail for less than three months, was a freed from the Leon County Jail immediately after linking up with State Attorney Willie Meggs’ office. Clearly, State Attorney Willie Meggs, Assistant State Attorney Jack Campbell, and his now deceased daddy, Larry Campbell, did not take Dawaun Williams having robbed two banks as serious criminal acts. WCTV News covered a press conference held by State Attorney Willie Meggs to announce an additional charge of Solicitation to Commit 1st Degree Murder against DeShon Thomas. However, State Attorney Willie Meggs and then Leon County Sheriff Larry Campbell failed to inform previous victims, the citizens of Tallahassee and citizens in surrounding counties that Dawaun Williams had been released from jail. Shortly after Dawaun Williams was released from the Leon County Jail, Dawaun Williams was arrested in Gadsden County on a slew of charges—including Home Invasion Armed Robbery with Kidnapping. Dawaun Williams was not the only Leon County Jail inmate to be coddled by State Attorney Willie Meggs’ office. Trentin Ross and Walter Cole Rayborn were directly stroked by Assistant State Attorney Jack Campbell. Trentin Ross, who was also being coddled by his attorney, Paul Srygley and Circuit Judge Charles Dodson Assistant State Attorney Jack Campbell convict DeShon Thomas has repeatedly been arrested. While, Walter Cole Rayborn sits in the Leon County Jail awaiting trial on Two Counts of Murder, Robbery and Arson. Lance Love and Cornellius Poole are said to be Walter Cole Rayborn’s victims. As Walter Cole Rayborn awaits trial for their murders, court records in the case are being Sealed. After DeShon’s mother fired Greg Cummings, Greg Cummings admitted to having been prevented to do important tasks by Assistant State Attorney Jack Campbell. Greg Cummings did not report Assistant State Attorney Jack Campbell to The Florida Bar for his unethical acts. However, DeShon’s mother and DeShon Thomas filed separate complaints against Greg Cummings. Despite of having openly admitted to failing to disclose information to his juvenile client, DeShon Thomas, Greg Cummings is being protected by The Florida Bar. DeShon Thomas’ mother, who has a bank account with Envision Credit Union, had a history of being in good standings with the credit union, until she herself was ‘robbed’ of nearly $30,000 by Greg Cummings. DeShon Thomas’ mother proclaims that her son, DeShon, was in fact ‘kidnapped’ versus wrongly convicted. Assistant State Attorney Jack Campbell is currently seeking to be elected Florida’s Second Judicial State Attorney. WCTV (Julie Montanaro/ Lanetra Bennett), will State Attorney Willie Meggs’ office use a bank robber in their case against Walter Cole Rayborn or Henry Segura? Author MAUL10Posted on May 19, 2016 Leave a comment on Envision Credit Union Robbery; Who is to Blame for the Increase in Tallahassee Bank Robberies? State Attorney Willie Meggs, Assistant State Attorney Jack Campbell, former Leon County Sheriff Larry Campbell, The Florida Bar? Tallahassee, FL—Florida’s longtime Second Judicial State Attorney Willie Meggs is not running for re-election. John Emmett “Jack” Campbell, who has consistently worked under Meggs for over a decade, is currently running to become Florida’s next Second Judicial State Attorney. Jack Campbell, the son of former Leon County Sheriff Larry Campbell (deceased), prosecuted many cases involving children—whereas in most of those cases Jack Campbell’s dad’s employees (Leon County Sheriff’s Deputies) dominated the state’s witness list. But, in the cold-blooded murder case of 19-year-old, Ann Grosmaire, State Attorney Willie Meggs, Jack Campbell and Leon County Sheriff Larry Campbell, along with a local defense attorney named Gregory Cummings, had come together and used Restorative Justice—a diversion program particularly used in high schools mock courts—to play a role in the prosecution of 19-year-old, Conor McBride. Special provisions were made at the Leon County Jail by Sheriff Larry Campbell to accommodate Conor McBride. Conor McBride was a clean cut white young man who walked into the City of Tallahassee Police Department and admitted to shooting Ann Grosmaire point-blank in the face with his dad’s shotgun—leaving her alone on the floor in his parents’ home. McBride explained that he and Grosmaire had been arguing prior to the shooting. What was later learned was that while Grosmaire’s parents were oblivious to Conor’s past abuse of their daughter, Conor’s parents were not. Conor McBride had anger management problems at the time of murdering Ann Grosmaire—yet, Assistant State Attorney Jack Campbell and others coddled Conor McBride, the adult young man, as though he had not taken the life of a young vibrant woman. Assistant State Attorney Jack Campbell may have asked Conor McBride to choose his sentencing, but when the time had come for Jack Campbell to prosecute children as adults, those children had no choice. In fact, Assistant State Attorney Jack Campbell told judges what attorneys to assign to cases of those who represent indigent clients. And the judges went along with Assistant State Attorney Jack Campbell’s instructions. With the help of Lead Public Defender Nancy Daniels, Jack Campbell manipulated pay codes in order for attorneys who were not registered to represent indigent clients in certain cases—to get paid—while undercutting other attorneys. Assistant State Attorney Jack Campbell and Lead Public Defender Nancy Daniels would go to such drastic measures to manipulate the pay code to undercut registered attorneys was a way to intimidate local attorneys who wanted to represent their clients lawfully—to show that they (Meggs and both Campbell’s) were in complete control the outcome of all cases within the Second Judicial Circuit—telling judges what to do and controlling and financially providing for defense attorneys willing to “play ball” with them. Assistant State Attorney Jack Campbell needed to convict children and send them away to adult prisons—leading to wrongful convictions. 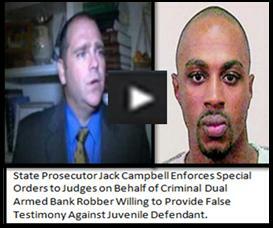 Assistant State Attorney Jack Campbell has the characteristics of a child molester. All of those within Florida’s Second Judicial Circuit should be aware of how well “child molesters” blend in—i.e. former United States Speaker of the House Dennis Hastert. A child hunted down and shot dead by an adult male should have been an open and closed case. Trayvon Martin did not deserve to be murdered. As Trayvon Martin rests’ in peace, George Zimmerman seemingly can’t find any peace. George Zimmerman, who apparently has always suffered from a mental disorder, is showing the world that seventeen-year-old Trayvon Martin was better than him during his short lifetime and even more so better than him now in his death. George Zimmerman was a bully—who picked on children—who chased after Trayvon Martin and with a single shot took Trayvon Martin’s life. DeShon had not received the book. Three months after she received a tracking number from Prison Legal News showing that the book had been delivered to the Post Office Box for Gulf Correctional Institute in December 2015, so she began making phone calls to Gulf Correctional Institute. Next, on March 17, 2016 DeShon received a Notice of Rejection or Impoundment of Publication from Gulf Correctional Institute. The Notice of Rejection or Impoundment of Publication stated Prison Legal News, “Is REJECTED and may not be received by inmates. The Department’s Literature Review Committee has reviewed the publication and determined that it contains subject matter that is inadmissible per Section (3) of Rule 33-501.401 F.A.C., Admissible Reading Material; (3)(1) It contains an advertisement promoting any of the following where the advertisement is the focus of, rather than being incidental to, the publication or the advertising is prominent or prevalent throughout the publication. (1.) Three-way calling services, (2.) Pen pal services, (3.) The purchase of products or services with postage stamps, or (4.) Conducting a business or profession while incarcerated. With all of that said, DeShon’s mother was really confused as to why Gulf Correctional Institute discredited and rejected publication clearly approved by Prison Legal News when PLN is clearly a creditable non-profit organization. The total cost for the book including shipping was $45.95. Both DeShon’s mother and the taxpayers of Florida have spent thousands of dollars on DeShon’s case and incarceration, since January 29, 2011. Second Judicial State Attorney Willie Meggs and his Assistant State Attorney Jack Campbell refused to allow the District Two Medical Examiner’s Office to release the victims’ autopsy reports. Not only was the refusal to release the victims’ autopsy reports a violation of DeShon Thomas’ Constitutional Right “due process of law”, the refusal to release the victims’ autopsy reports is a violation of Florida Sunshine State Law—Public Record. Second Judicial State Attorney Willie Meggs clearly violated ALL of those laws. Second Judicial State Attorney Willie Meggs refused to prosecute Governor Rick Scott for violating Florida Sunshine State Law—Public Record. Governor Scott has just about been forced to settle every lawsuit that has be brought against him since taking office—causing Florida taxpayers to pay nearly a million dollars or more for his IGNORANCE to understand that state agencies CANNOT AND SHOULD NOT be operated the same as private businesses. The citizens of Florida DEMAND TRANSPARENCY in their government. In 2013, as DeShon was about to go to trial in Leon County, the news reported that two inmates walked out of a Florida prison—it was said that the inmates had forged court documents that cleared their release, and had received outside help to have those documents filed in Orange County. The inmates were quickly apprehended. Attorney General Pam Bondi was mute about Gerald Bailey’s claims. Governor Rick Scott laughed it off. During the investigation of the inmates “escape,” there was no blame of any publications—such as those produced and/or those purchased by prison inmates or their family members—as to having assisted the inmates with forging documents. DeShon Thomas was 17-years-old when he was charged with Cultivation of Marijuana, Possession of Drug Paraphernalia, Two Counts of 1st Degree Murder, Possession of a Firearm by a Juvenile Delinquent. Seventeen months later—simultaneous to firing his private paid attorney, Greg Cummings,–DeShon was charged with Solicitation to Commit 1st Degree Murder with the target being Trentin Ross, who was the key witness used by the Leon County Sheriff Office and State Attorney Willie Meggs’ office (Assistant State Attorney Jack Campbell). (Leon County Sheriff Larry Campbell is the dad of Assistant State Attorney Jack Campbell.) There was no physical evidence to show that DeShon had committed the murders. DeShon was at work when all outgoing cell phone activity from the victim, Laqecia Herring’s cell phone stopped. Time of death is a key factor to DeShon’s defense. DeShon’s mother paid Greg Cummings nearly $30,000 over sixteen months to defend DeShon. Greg Cummings refused to depose Trentin Ross, Leon County Sheriff’s Detectives, and Dr. Anthony Clark with the District Two Medical Examiner’s Office. Greg Cummings refused to provide DeShon and DeShon’s mother with the victims’ autopsy reports and documents relating to their autopsy reports. The Florida Bar refused to properly address DeShon Thomas’ complaint against Greg Cummings. Which once again proves that the STATE OF FLORIDA IS BEING OPERATED BY CRIMINALS, WHO ARE PROTECTING CRIMINALS. Denying DeShon Thomas or any prison inmate a self-help legal book purchased by the inmate or their family member or friend is not a threat to the Department of Corrections or other prison inmates. Self-help legal books may just be a threat to the judicial system—with inmates learning how they may have been “wrongly convicted” or “kidnapped.” The same as white people spent centuries keeping African slaves from learning how to read and write in the English language. When will those in office realize that people cannot be suppressed FOREVER! African slaves were eventually taught to read and write in the English language. Now, today, white people in office are being forced to learn how to read and write in the Spanish language. Exonerations are occurring around the nation on a daily basis—everywhere but Florida. The Florida Innocence Project has not announced a single exoneration since Governor Rick Scott and Attorney General Pam Bondi took office.